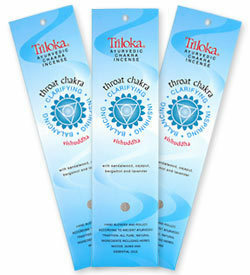 Our Ayurvedic Chakra incense line has been custom blended to incorporate ancient knowledge of Vedic medicine and the yogic knowledge of the energy that emanates through the charkas (energy centers of the body). Ayurveda, the “science of healthy life” originated in the Himalayas thousands of years ago. Aromatherapy has been part of this Vedic tradition for ages. In Ayurveda, certain flowers, woods, herbs, resins, and oils are recommended to bring about the balance of energy resulting in a healthy body and mind. We have taken great care to create incense that not only smells wonderful, but also emits the beneficial vibrations of the plant essence. In some instances we have blended the plant in its various forms (i.e. rose oil and rose petals) to enhance the energy of the incense while burning. Chakra is a Sanskrit word meaning wheel or vortex. We have seven main Chakras (energy centers). Each Chakra is connected to certain parts of the body, as well as with our mind and spiritual development. Chakras can be activated and balanced to create a life of harmony, health and spiritual awakening. 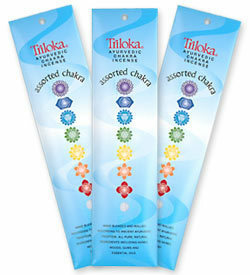 Our package design for the Chakra incense reflects the traditional symbol and color of each Chakra. The back of the packaging provides an explanation of the Chakra, the special ingredients used, their benefits, as well as general information about Chakras and the science of Ayurveda.